You are here: Home / Snow… shoes! Well, it has been quite awhile since we’ve gotten any snow. 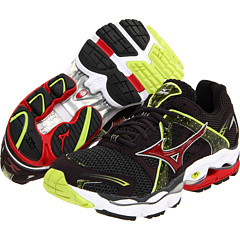 So, this morning, I laced up my Mizuno Wave Enigma running shoes to head out the door. I was hoping to be able to test out the Mizuno Wave Prophecy, but the representative at Mizuno mentioned that they were completely out of the Prophecy and weren’t expecting to have any more for several months to come. They must be an extremely popular shoe! Have any of you been able to get your hands on a pair? Or, should I say feet? Anyways, if you’ve tested them out, let me know how you like them in the comments section below… I am really curious. That’s the first time I’ve heard of a shoe company being back-ordered on a shoe for such a long period of time. Anyways, I headed down the street this morning in my Enigmas. It was a bit warmer outside today than it has been the past week. I felt good and my legs were moving right along. Well, not even a mile after I took my first step… a snowflake fluttered down in front of me… and another… and then, it just started coming down like crazy! Huge, fluffy snowflakes surrounded me. I couldn’t believe how hard it was snowing. It was beautiful. Within a few minutes, the snow started accumulating on the ground. I made a quick decision, flipped around and headed back home. I couldn’t wait to get back and throw on my running snowshoes to hit the trails. I hoped I could make it home and get my snowshoes before it stopped. There’s nothing quite like running through the woods in the fresh powder as you are surrounded by fluffy puffs of snow swirling around you. Well, I made it home, picked up my snowshoes and headed to the trails. It was amazing. So peaceful and calm. I was the only one out on the trail… my freshly made tracks following me up and down the rolling hills. I was wishing that I had my camera with me as I passed between evergreen limbs now bowing to the weight of the new fallen snow. Its great to be able to get out there and just enjoy the day, being in the moment and enjoying mother nature in all of her splendor.